I don’t really use thins space anymore but I thought I would round out the year with this post. 2012 was a ridiculously active zine year for me. It started with creating the StolenSharpieRevolution.org site to be a companion to my book. The site includes a Zine Event listing calendar. In February I attended the first L.A. Zine fest and it was great! In March I attended the Chicago Zine Fest and it was really fun. We even had a Zine Organizer’s Event where we met with other zine event organizers to talk shop and I released my very first fiction zines (Brainscan #29) as a split with No More Coffee #4. In April I helped the fine folks at Zine Works run zine workshops at Coachella. I made some really great friends and got to see some great bands for free. In May I opened a brick and mortar storefront and online shop in Portland, Oregon called Portland Button Works and zine distro. July was International Zine Month and I created a poster of events to do for each day of the month.and participated in the 24 hour zine thing. August had the Portland Zine Symposium that I helped organize and I hosted a bunch of guest at my house. In September I quit volunteering at the Independent Publishing Resource Centerafter over a decade of volunteering because I just didn’t have any more time for it after opening the Portland Button Works shop. October and November were big months. I had been saving for a UK trip for a few years and somehow we had also planned for The Copy Scams, our zine themed pop-punk band, to record and tour. We wrote 3 new songs that we hope to release next year. I got to hang out with a lot of my awesome Uk friends and attend the Leeds Zine Fair and the SE London Zine Fest. I kept a bit of a travelogue on tumblr and put out issue #7 ofNobody Cares About You Stupid Zine Podcast, it’s all about trading zine. So, now it is December and I did a bit of updating to the Etsy Team Zine and my own Etsy shop and changing it over to a Portland Button Works shop. I’m also offering free shipping Sunday and Monday in my Etsy shop when you use the discount code: POSTMAN. I also hope to work on my new zine this week. It’s all typed up and I just need to do layout. I also just signed up for the 2013 Chicago Zine Fest! Hope to see you there. I got my “contributor” copy of Fanzines in the mail pretty quickly. I pick it up and look at it and then get angry and have to put it back down. There are numerous errors. Some may seem nit-picky like the version of Stolen Sharpie Revolution she used is from 2002, not 2003 as stated. Some errors are much worse. I also found that there is a screen shot from my housemate Marc’s zine review site Zine Thug. He says that permission was asked, but he stated he would like a contributor copy. He has not received one yet. I was also flipping through the pages when I was on a skype chat with my friend Steve Larder and stumbled across one of his illustrations for the cover of the UK zine yearbook. He had no idea it was there. In more exciting news! 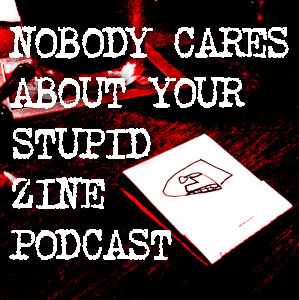 There is a new issue of Nobody Cares About Your Stupid Zine Podcast! In the second installment of Nobody Cares About Your Stupid Zine Podcast, Alex Wrekk is joined by Derek Neuland. We find out who Derek is, how he got into zines, and much more. We also find out what Alex has been up to since the first podcast, which included traveling to many countries, touring the United States with 5 folks from the UK, and much more. They also discuss their experiences organizing the 2010 Portland Zine Symposium, their excitement for the 2011 Chicago Zine Fest, and much more. You can listen to you it here, or download it into itunes or your favorite podcatcher. In one week I’ll be sitting behind a table at the Portland Zine Symposium. One week from today I’ll also be playing a show with our impromptu zine band, The Copy Scams. What was I thinking? Planning a national zine tour? Organizing a huge zine event? AND starting a band in a month that will only play one show? At least most of the tour planning is done and this year all of the zine symposium organizers are extremely competent so I’m not too concerned with that as much as I have been in the past. So, The Copy Scams is really going to play a show. So far we have 3 songs with catchy sing-a-long chorused that get stuck in my head. The weird thing is that the music is something I would want to listen to. Steve knows me well! The 4th song is going to be the Phoenix Lights song that Paul and I did acoustically at my Powell’s reading for Smallpressapalooza. We haven’t practiced it yet as a band but I still know the words from before so it should be easy. I’m not sure what the 5th song will be but we only have a week to write it. It should probably be an outro song! I just realized the other day that I could make a zine of the lyrics and use it as a prop in case I forget! I should work on that soon but right now I have buttons to make. Purchase at Portland Button Works Alex Wrekk's Etsy shop Powell's Books ln the UK or Europe? Purchase from Rum Lad!